MRSA (methicillin resistant staphylococcus aureus) is a type ofstaphylococcus bacteria (staph) that is resistant to beta-lactam antibiotics. MRSA is contagious and can cause life-threatening infection. The majority of MRSA infections remain restricted to the skin. HA-MRSA can cause severe illness, where the bacteria can spread to the blood, bones, and other tissue. 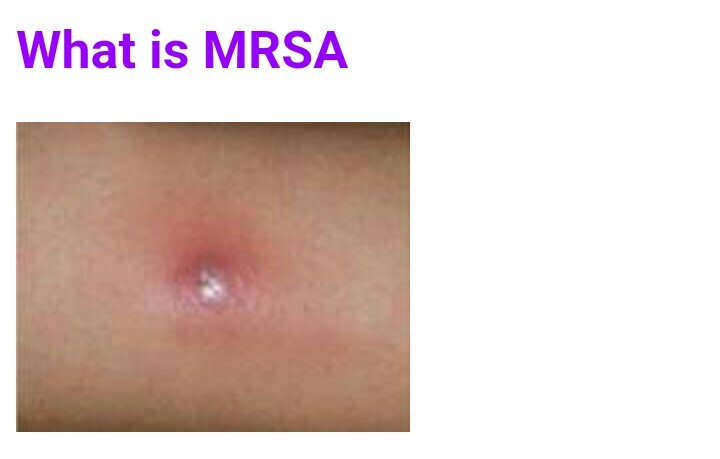 CA-MRSA usually causes skin infections. Areas that have been cut, scratched, or rubbed are vulnerable to infection. Areas of increased body hair—such as the buttocks, armpits, back of the neck, and beard—are more likely to be infected. Infected areas are red, swollen (fluid-filled) and painful to touch. The lesion may resemble an infected spider bite. Typically, there is yellow or white center and a central head. Pus and other fluids may drain from these lesions. The spectrum of MRSA skin infections includes infection or abscess of hair follicles (furuncles), abscesses, and carbuncles (a mass of infected furuncles). MRSA can be sensitive to other antibiotics. Intravenous antibiotics are used to treat severe infections. Not all CA-MRSA infections are treated with antibiotics. The doctor may choose to drain an abscess, rather than treat with antibiotics.